Does Edelbrock 1411 fit your vehicle? 1411 is rated 4.8 out of 5 by 9. Rated 5 out of 5 by Vrod from Beautiful carb. Exactly what I was looking for .the cherry on top of my 355 small block chevy . Rated 5 out of 5 by John1970 from I got the edelbrock 1411 for a 1984 dually with a 454, I have already tried 2 other carburetors with vacuum secondary that didn't work as good as the edelbrock 1411. I have no problem with stumble or overloading. I have not pulled a heavy load yet, but I'm very convenient that it is going to do very well. I have tried different carburetors & keep going back to the edelbrock carburetors. Rated 5 out of 5 by Ron 72 from great product I brought the carb about a month and half ago install it and it ran good with adjustment to the idle speed. Rated 5 out of 5 by Flyer from Great choice for my 454 This is my second 1411. I've had nothing but issues with "the other" brand. Both times the 1411 has solved the problems. Edelbrock will be my go to carb in the future. Rated 4 out of 5 by Luke N from Really nice carb Got this in a performance kit for my olds 455. With the performer intake the only way i could be happier is if the carb came with a little more hardware for linkage fabrication but regardless the results speak for themselves. 0-60 in 4.9 from roll on stock diff. I&rsquo;d like to go with this carb with a dual plane on my 6.0 only one I found was the rpm why is it not recommended to bolt this carb to rpm intake? This carburetor has an electric choke, the Edelbrock 1407 has a manual choke. 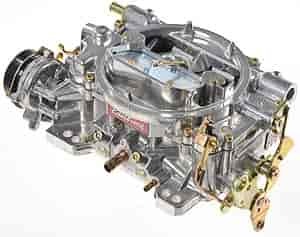 Is the 1411 a vacuum secondary carb? These have a mechanical secondary, but also use vacuum to assist the airflow. I just bought a 68 chevelle that has an edelbrock 1411 sitting on an Edelbrock performer rpm. I just read that this is not recommended, can you tell me why? There's multiple different ways that may not be recommended with such little info. There's no reason against bolting a 1411 to the rpm manifold. The Edelbrock carbs are 9/16 - 24 thread on the inlet. I have a 440 engine in my Dodge R/T with a Edelbrock Performer 440 manifold, Is this manifold ok for this carburator. ? Yes. The manifold and carb match.